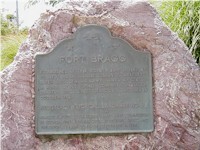 Fort Bragg was established on June 11, 1857, by 1st Lieutenant Horatio Gates Gibson, 3rd Artillery, US Army. Gibson, who later became a Brigadier General, named the fort in honor of his former company commander Braxton Bragg. The fort was abandonded in October 1864. 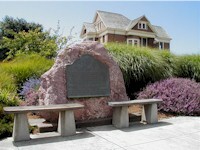 Today, Fort Bragg is a town of over 7,000 residents. 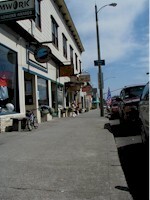 Shops and cafes along a downtown sidewalk on a sunny summer afternoon. Close-up of the official state marker plaque.